Relocating house or moving office? Clueless about how to execute the demanding task of packing and moving! Undoubtedly, packing and moving require to outclass skill, ability and perfect temperament. Not everyone can pull out a flawless relocation. Thus, entrusting the task to a professional removalist company can help cut problems. 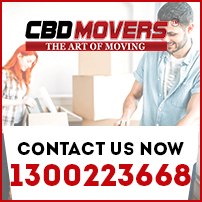 CBD Movers™ is a trusted and well-renowned name in Melbourne. Our wide range of moving and removal services accommodates the distinct needs of house moving, office shifting and furniture moving deftly. Empowered by the finest personnel and equipped with the latest tools and techniques, we ensure a pleasant and positive transition. At CBD Movers, we take pride in our outclass services. Our comprehensive and fully customized ‘Movers & Packers’ services help you move your entire home and office set-up with competence and skill. Our ‘Two Men and a Truck’ deal are perfect for moving furniture pieces like pool tables, piano, couches, etc. Right from planning your relocation to pack, move, unload and rearrange belongings; you can rely on us for a full-service deal. We excel in disassembling and reassembling furniture. Our sophisticated packing material and superior skills help you move furniture with the utmost competence. We strictly follow pre-set schedules and comply with the rules and regulations of each territory. We hold all the necessary licenses to undertake local, interstate and international removal jobs with ease. Our huge fleet of trucks is well equipped with climate control systems and other supportive gear. With us in charge, you are sure to experience a memorable relocation. 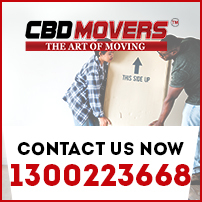 At CBD Movers, we take pride in our outclass services and the lowest rates. Our policy to cut every competitor quote by 10% makes us the cheapest removalist in Melbourne. We also offer comprehensive transit insurance, making your move the safest one. Our operations are transparent and have no hidden extras. Heidelberg, a suburb of Melbourne, Australia, is nearly 13 kilometers north-east of the Melbourne’s central business district. Spread over an area of 2.7 square kilometers, Heidelberg Heights North, West is home to nearly 6,000 people. Beautiful homes, well structured office spaces, great connectivity and amazing community feel; Heidelberg offers everything. 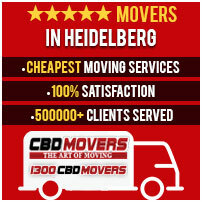 At CBD Movers, we extend our services to help people move in and from Heidelberg Heights North, West with ease. Our services are affordable, safe, reliable and in-time. Call us at 1300 223 668 to know more about our unmatched removal services.